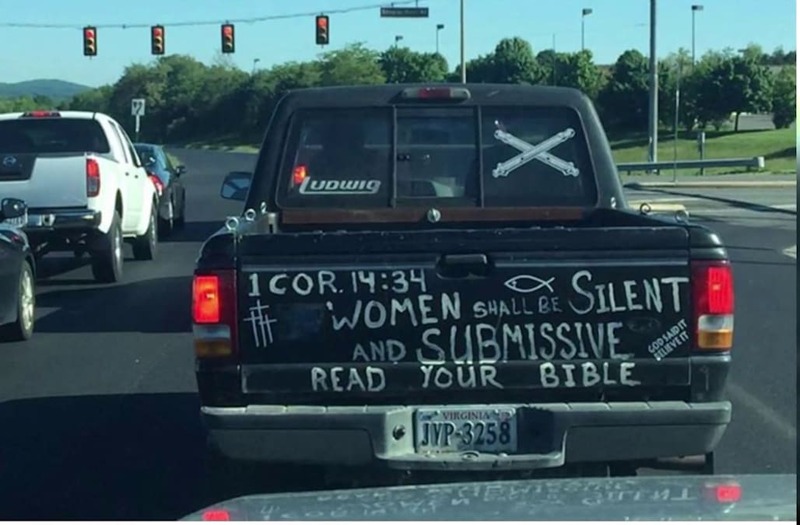 CHESTERFIELD, VA. (WTVR) – Plenty of Virginia residents have reacted to the Bible verse painted on the back of a pickup truck that calls for women being "silent and submissive," but the owner said he's trying to get across a different message. People have long posted images of the black truck on social media, and just last week, it made the news after it was spotted in Leesburg. The truck's owner Tom Hicks said he put the scripture on there about five years ago. The verse is drawn from the First Corinthians, and reads "Women shall be silent and submissive." Along with the verse, Hicks painted on three crosses, the fish symbol and the expression "Read The Bible." "The reason I put this particular message on, I want people to read the Bible, I want them to see this message and say is that true," he said. But Hicks said that the true reason behind the verse is because he is an Atheist, and he is driving drive home the message that the Bible itself is offensive. "Right now I don't believe there's a God so I guess you would say I'm an Atheist," he said. "It's a hateful, hateful piece of work which Christians try to turn around and they talk about love," he added. Most who read the message on the tailgate believe Hicks is trying to send a biblical message. The driver in Northern Virginia, who spoke to WUSA on the condition of anonymity called it "outrageous and offensive." "It concerns me that something like this has become accepted in some ways," she said. "And that it's ok for folks to feel free to show such hateful and misogynistic thoughts. " Hicks said he hopes people's offense translates into action. "Hopefully people will read it and learn for themselves, these preachers and priests and ministers, they're making stuff up," he said. Regardless of Hicks reasoning, Christians said the Bible isn't a book of hate. "There are parts of it that are offensive to people because not everyone wants to believe the gospel, they don't want to believe Jesus came and died and rose again, but that is true," said Amy Meadows. As for the single verse Hicks chose, a Baptist preacher of 27 years has some comments of his own. "As you look at that, you can definitely see it is completely taken out of context," said Pastor Joey Anthony, with Mt. Pleasant Baptist Church. "Especially when you think about what the Bible says." "Jesus really did raise women to a level – where as in that culture they were seen as second class citizens – but Jesus loves all people and he raised women up to a different level, really," he added. There is violence in the Bible, Anthony acknowledged, but there is also love. "The very person who wrote that passage of scripture in Corinthians, also wrote in Ephesians that husbands are to love their wives just as Christ loved the church, which is an unconditional love, and it's a sacrificial love," Anthony added. Hicks said he's never thought about taking the scripture verse off his tailgate, but he has considered highlighting different verses. He also said he's become accustomed to people taking pictures of his tailgate and mouthing obscenities at him. But he also said one of the most common responses, is other drivers flipping him off.